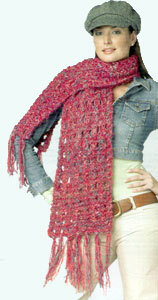 Scarf measures 9" x 48" without fringe. MODA DEA™ "Dream™": 2 Balls No. 3773 Raspberry CB. Knitting Needles: 15mm [US 19]. Crochet Hook: 11.5 [US P-16] for fringe. GAUGE: 8 rows = 4"; 10 sts = 4" in pat. CHECK YOUR GAUGE. Use any size needles to obtain the gauge. NOTE: Hold one strand each CA and CB held together as one throughout. Row 3: K2, * yo, K2tog, K1; rep from * across. Rep Rows 1-4 for pat until scarf measures approximately 48" from beginning. Bind off. Weave in ends. Fringe: Cut 22" lengths of yarn. Holding 2 strands each of CA and CB together, fold in half forming a loop. Insert crochet hook from the wrong side of the fabric in a yo sp and into the loop and draw the loop through, then draw the yarn ends through the loop and tighten. Rep in every sp across each short edge. Trim yarn ends. ABBREVIATIONS: CA, CB = Color A, Color B; K = Knit; mm = millimeters; pat = pattern; rep = repeat; sp = space; st(s) = stitch (es); tog = together; yo = yarn over; * = repeat whatever follows the * as indicated.